Original and exclusive free printable Easter maze from Kate.net! This printable Easter maze is © Kate.net. 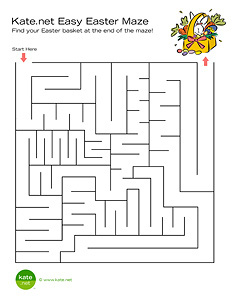 This maze may be printed for personal or school use; however, it may NOT be offered or distributed elsewhere in any format, whether commercially (for a fee) or for free (may NOT be put on other web sites, on disc, etc.). You may NOT link directly to the PDF file; however, you are welcome to create a link to this page's URL. Thank you! In order to open this file, which is in PDF format, you'll need the free Adobe Acrobat Reader. Most people already have this on their systems. Click on the thumbnail below to load the PDF file. Copyright � 1994-2015, Kate.net. All rights reserved.